a women, queer, and trans* centered bicycle workspace rooted in justice principles. As a city dweller, sometimes it’s easy to forget that the majority of land making up These United States, isn’t contained under concrete anxiously awaiting it’s turn as the next foundation for a Starbucks, but way the hell out in the middle of nowhere, with maybe some corn on top of it. The land between the urban and rural is made up of sprawling suburbs, and a new kind of combo-pack called an exurb. 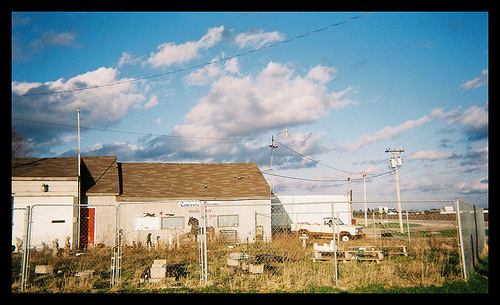 Distant strip malls and forgotten outposts of manufactured homes, where sidewalks go to die. Anyone who has ridden her bike more than about 30 miles in any given direction (unless they were riding into the ocean) has undoubtedly encountered this awkward mess of infrastructure and pseudo-development. Anyone who has ridden further, can tell you about the terrifying network of two lane highways that stitch together massive swaths of raw land out in America’s farm country, where drivers are categorically impatient and reckless. Not unlike most city drivers, but in the country, all this recklessness happens at top speeds with no shoulder and dozens of miles between gas stations/ambulances. Some people take entire bike tours with the express purpose of exploring these roving fields of genetically modified subsidized agriculture that make our country so great, but later on, when they are back in that new Starbucks that just opened, uploading photos from their sweet tour, they will still think of city cycling as preeminent and all other cycling as extracurricular. This thought pattern does a huge disservice to a great number of bike enthusiasts who actually don’t live in cities, but in these exurbs and rural outposts, for whom a commute to work might take 30 miles on dirt roads when the deer are still out and the sun hasn’t boiled the pavement yet. People for whom the point of cycling isn’t to run to the grocery store and back because that would take 4 hours, but will ride for pleasure, often up and down the same stretch of highway on their thrifted mountain bike every afternoon. In the suburbs, when amenities are marginally closer, but infrastructure is equally lacking, cycling can be even more dangerous. Anywhere a sidewalk exists, drivers will wonder why you’re not on it. Traffic speeds are generally higher than in cities, and the roads tend to be wider with more lanes and tons of large, blind driveways leading to and from businesses along the strip of road, all of which can be dangerous and inhibiting for cyclists. It is in these places that I have seen some of the most dangerous riding of my life. People regularly riding in the street against the flow of traffic (although that happens in cities too but at lower speeds and with more traffic lights to slow everyone down), or riding on sidewalks (also against the flow) with grocery bags hanging from the handlebars, disobeying all traffic laws with no helmet, and dubious components. In places where the cycling community is not as large or as visible, there is very little peer pressure to keep the errant, unsafe cyclist in line. It’s a concrete jungle out there and it’s every Cannondale for herself. That’s how people die. Part of the mission of Fender Bender is to make cycling accessible to people who don’t have resources where they live, which is often the case with folks who are stationed outside the city center. In areas of sprawl, car culture is dominant in practice and mentality. We design communities that are so heavily dependent on motor vehicles that even the thought of riding a bike a mile away to the library or the bank feels like riding to Siberia. Getting over the mental block of car-dependence is the greatest challenge to riding in the outposts, but people are getting over that hurdle more and more every day and we are excited to encourage it. The simple fact of riding is that the more visible cyclists are, the more accepted it becomes as practice, which will inherently lead to more cautious drivers and better cycling infrastructure. Awareness leads to progress. Those who are riding on the fringe of cities and in farm towns, have the daunting task of raising visibility at a time when car culture has not yet caught up. Those who make the leap, knowing that the only way to make something safe is to do it while it’s still dangerous, are doing a great service for all the two-wheelers who come after them. We hear often that people ride on sidewalks because they assume it’s more dangerous to ride in the road where the cars are. This is patently false. FALSE. Don’t ride on the sidewalk! If you think cars aren’t looking for you in the road, they definitely aren’t looking for you on the sidewalk, and when they come flying out of their driveway, you are going to suffer. If you are in the road, they can see you and move around you. If you are on the sidewalk, you are telling vehicles that they don’t need to respect your space in the road because you have ceded it to them. Don’t give them the road! You pay for that thing too!! Get on it! The only way for us to achieve visibility and acceptance, is to create such an intransigent presence that cars have no choice but to respect us. But it takes a few brave, relentless pioneers to start that visibility and teach other cyclists. Every person who rides a bike is part of the cycling community whether they identify as such or not. We all benefit from visibility and safety. The duty is on all of us to teach each other how to ride safe, be respectful, and implement positive changes for cyclists in our communities. By focusing our bike activism on cities and urban dwellers, we are chopping off a huge number (I would argue, the majority) of cyclists who don’t have the luxury of living within a few miles of a bike shop and definitely don’t have the option of lobbying for bike lanes on the millions of miles of state highways that currently adjoin most of the country. The onus is on all of us to teach bike repair and safety to ourselves and each other so that anyone in any part of the country can have access to the kind of cycling that fits their lives. The invisibility of rural cyclists is intolerable, and only serves to make road riding more dangerous for those who choose it. If you live in a suburban, exurban, or rural area, why not start a group ride with your neighbors? Or get a bike-pool of folks together twice a week to ride to the grocery store as a group, or ride with your kids to and from school? There are myriad ways to gain visibility while also riding safely. If you’re not sure about the rules of the road or how to navigate city streets by bike, contact us or come to one of our full moon bike rides and get some practice! By gaining visibility and supporting cycling in all it’s forms across all landscapes, we can all make the roads safer for ourselves and others.